Have you heard? The new generation of Polly Pockets just released! If you were a child of the 1990's then I'm sure you are with me when we say these are absolutely the best toy EVER! Just like the 90's you can bring these around with you everywhere right in your pockets making this a toy every child is going to have on their Christmas list and we are predicting a huge success. The super popular toy has gotten a makeover with a slightly bigger design that is much more modern than the previous 80's version. With playsets from just $4.99, what are you waiting on? Below is a handy guide where you can get your hands on the new 2018 Polly Pocket toys. 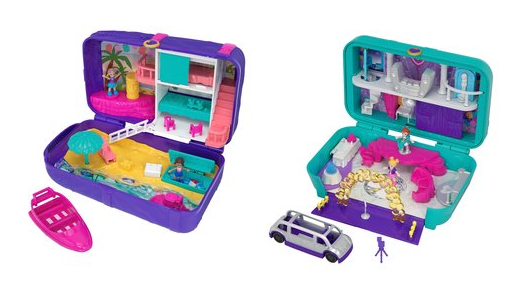 The most similar toys to the ones we remember are the Polly Pocket Pocket World play sets. Each little compact opens to reveal a themed 'world' that comes complete with Polly and her friends. They are priced at about $14.99 and you can choose from Flamingo Floatie, Cupcake Compact, Sugar Rush Cafe, Ballet Compact, Snow Secret, Sea Sandcastle and Shopping Mall. If you want Polly Pockets on a budget the Tiny Pocket Places are priced at just $4.99 making them a great value for the money. This is the smallest versions of the playsets they offer making them perfect for little one's pockets. Each compact opens to a fantastic little world including a Studio, Aquarium, Concert, Picnic, Ballet, and Camping. You can even find Polly's new best friend Lila! Looking for even bigger Polly Pocket fun? These larger Hidden Places play sets are sure to excite you and for about $19.99 the price is right on as well. Being larger these are perfect to throw in your backpack, handbag, suitcase or even keep in the car. When you open them they reveal a larger Polly Pocket world that is truly amazing and will engage children for hours at a time. You can choose between Beach Vibes or Dance Par-taay. Each one comes complete with a matching vehicle to add to the fun. What Other Polly Pocket Toys Can I Buy? There are actually more products then you think. Polly Pocket Go Tiny! Room Playset is available at Target for $39.99. Target also has a Polly Pocket SUV Secret Utility Vehicle that will have you spinning around with all your new Polly Pocket dolls for just $25.99. Want to dress up just like Polly? Check out this light-up Polly Pocket Tiny Power Locket which is a replica of the exact same one Polly wears on her hit TV show. How Tall Is A Polly Pocket Doll? These new toys are miniature dolls that are found inside of the compacts. While they are still miniature size just like the 1990's they are just a tad bit bigger giving them a modern style that you will love. What Are Polly Pockets Made From? The new Polly Pockets are made of flexible plastic that is bendable so you can sit her in chairs with ease. We find that the flexible plastic is much more sturdy than the original slotting in wholes that they made in the 90's.